The 25.54 metre motor yacht Mrs Happy, listed for sale by Jeff Stanley at Gilman Yachts, has been sold with Dean Young at HMY Yacht Sales acting for the buyer. Built in GRP by Taiwanese yard Johnson Yachts to a design by Bill Dixon, Mrs Happy was delivered in 2007 as a Johnson 87’ model and refitted in 2011. Accommodation is for eight guests in four cabins consisting of a main deck master suite with king sized bed, a VIP suite with a queen sized bed and two doubles, each with a queen sized bed. All have full en suite facilities. The large saloon has comfortable seating, an entertainment centre and full bar and is open plan to the forward dining area. 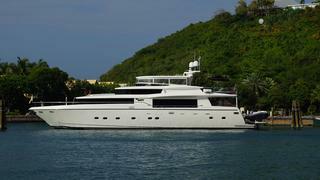 A $500,000 refit in 2011 opened her up to even more features and open spaces. Perhaps the most notable new feature on Mrs Happy is the relocation of the tender to a newly installed hydraulic platform aft, which opens the former flybridge boat deck area into a sundeck with abundant deck space and free standing loungers. Forward on the sundeck, shaded by the Johnson signature hard top, is a walk behind bar with stools, an al fresco dining area, full helm and plenty of seating. Twin 1,800hp MTU engines give her a cruising speed of 18 knots and a maximum speed of 25 knots. Located in Fort Lauderdale, Florida, Mrs Happy was asking $2,750,000.